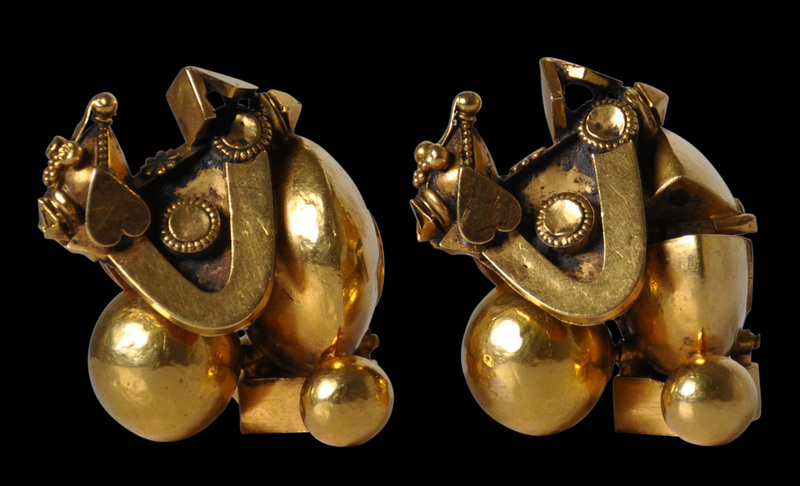 This spectacular and abstract pair of ear ornaments is made from sheet gold filled with lac. 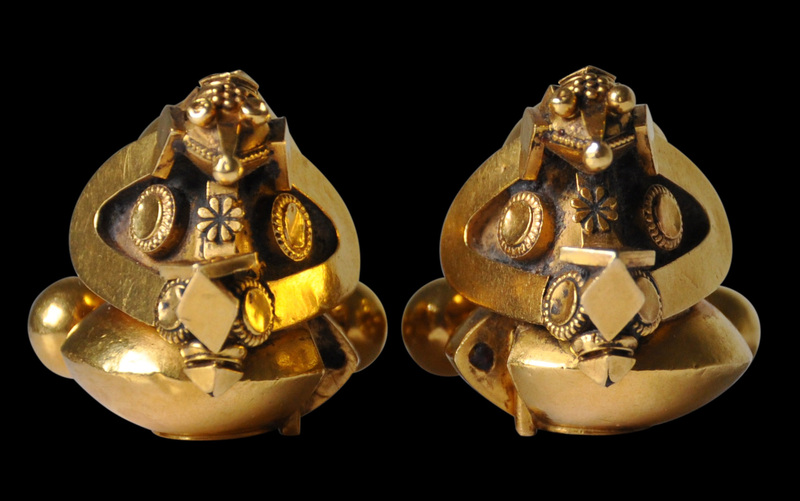 They are large and impressive, and designed to look heavy but in fact are relatively light to wear. 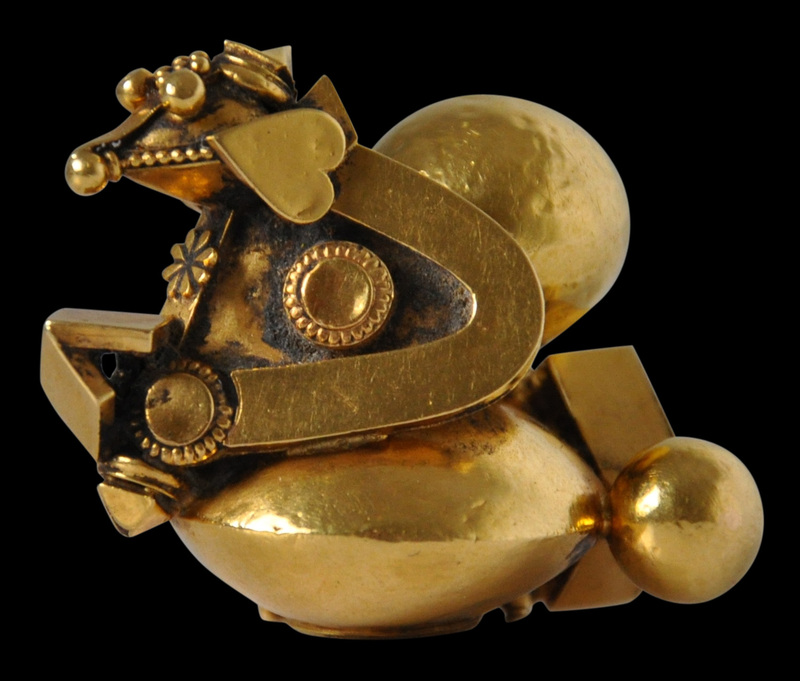 The form of each comprises spheres, compressed spheres, triangles, and a stylised cobra (naga). Further decoration has been achieved with applied floral gold plaques, heart shapes and granulation work. The larger spheres have been interpreted as the cobra’s eggs. Some, however, have interpreted the form to represent not a cobra but a bird, with bird’s eggs (Untract, 1997, p. 443). 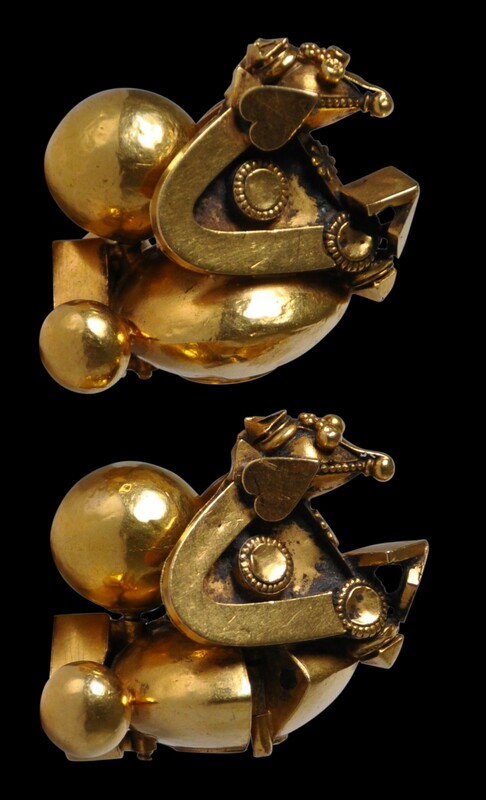 The form seems modern but in fact is at least several hundred years old (Bala Krishnan et al, 2005, p. 114) but the fashion to wear them largely disappeared by the 1940s. 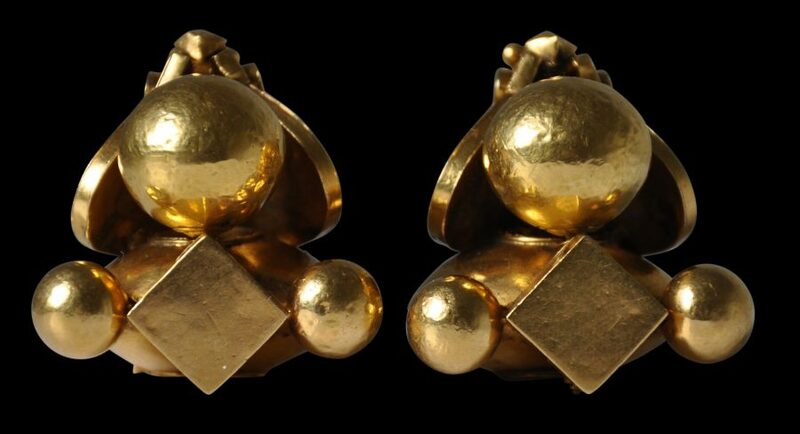 Worn in elongated earlobes, such ear pendants were worn along the southern Coromandel coast and as far in land as the temple city of Madurai, and also into neighbouring Kerala state by wealthy women members of the (lower) Velalar Nadar caste according to Bala Krishnan & Kumar (1999, p. 172) and by women of all castes other than the Brahmins, according to Ganguly (2007, p. 238). Similar examples are illustrated in Bala Krishnan & Kumar (1999, p. 172, 236), Ganguly (2007, p. 238), Geoffrey-Schneiter & Crick (2016, p. 90) and Untracht (1997, p. 221). The pair here is large, complete, and particularly refined compared with most extant examples. There are appropriate signs of wear and use. Bala Krishnan, U.R.et al, Icons in Gold: Jewelry of India from the Collection of the Musee Barbier-Mueller, Somogy, 2005. Ganguly, W., Earrings: Ornamental Identity and Beauty in India, B.R. Publishing Corporation, 2007. 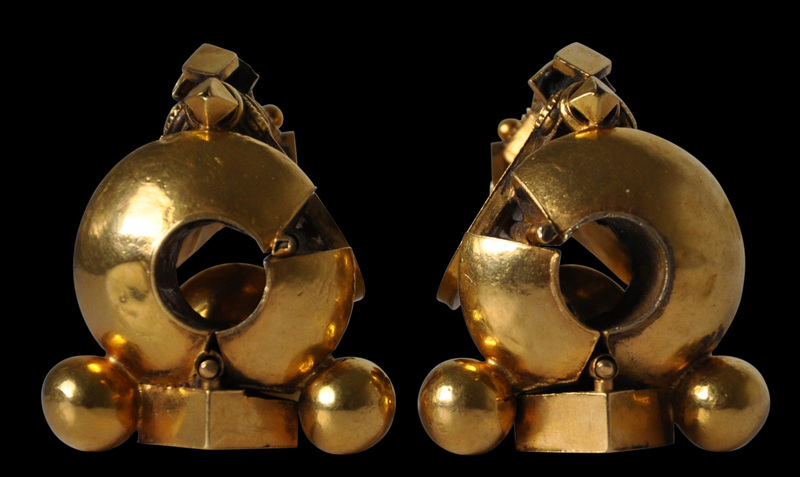 Geoffrey-Schneiter, B., & M. Crick, Bijoux D’Orients Lointains: Au Fil de L’Or au Fil de L’Eau, Foundation Baur, Musee des Artes D’Extreme-Orient/5 Continents, 2016.